She was born in a dumpster and rescued at about 2 days old. The first time we held her, her eyes were still closed and the umbilicus was still attached. Her mother was a feral cat, so a vet tech hand-fed the litter of three until she and her sister were ready to be weaned and come live with us. Her brother went to another home. 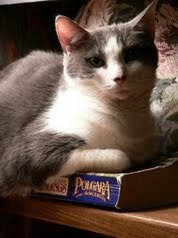 Polgara lived up to the inspiration and audacity of her namesake, the sorceress Polgara of David Eddings’ books. She was small-boned, dainty and a whole 8 pounds when she was full-grown. She had a ‘tude like a mountain lion and took no sass. But she was also smart enough to know when to beat a hasty retreat if she was outweighed and outplayed. In November, we noticed a bump on her left shoulder blade. In December, it had grown enough that we took her to the vet (or as she called it, “The Shoppe of Horrors”). It was diagnosed as being a fibrosarcoma, rare in cats these days with changes in vaccines. At almost 17 years old, we did not opt for surgery (she would have lost a whole leg!) or kitty chemo. We knew we had chosen kitty hospice, so we got a pain med for her from our vet, made sure she had cozy places to sleep, and spoiled her with treats and extra snacks. 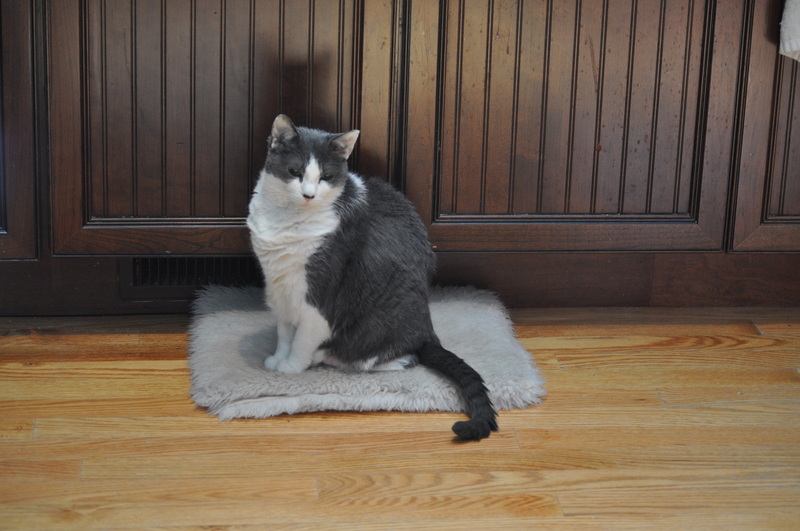 The toasty spot – right in front of a heater vent in the kitchen! As winter got colder, she looked for toasty spots around the house, choosing a sunny window, or putting her affected shoulder near the heater vent. We created cozy beds for her there. This last weekend, we saw that climbing steps had become difficult for her. And if she tried to turn suddenly to the left, she would stagger and catch herself before completely losing her balance. She had stopped grooming herself as meticulously, (probably because it hurt to twist and groom her back), and she wasn’t playing with pingpong balls, or doing her “nighttime crazies” romp around the house. 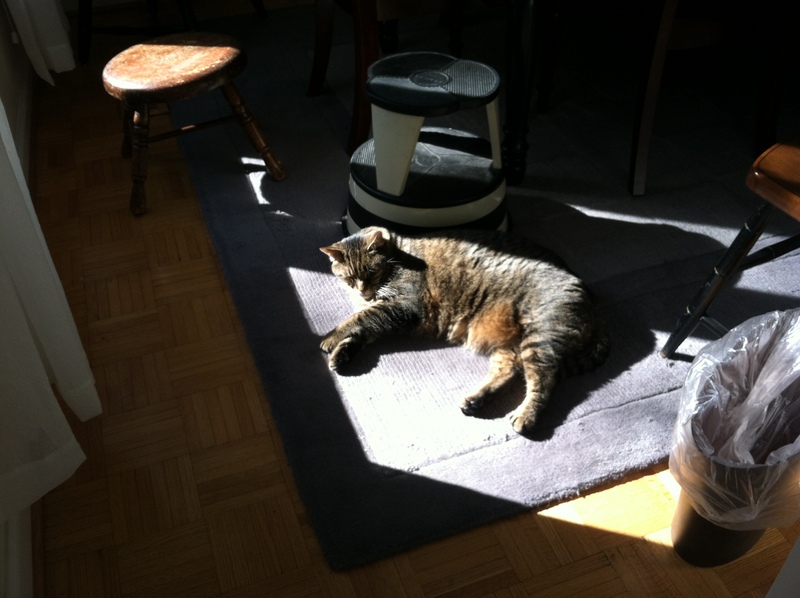 On Monday, I took her to the vet… knowing that probably it was not going to be a round trip. Life goes on. We are sad. It’s kind of a stop-and-gut-check moment, to appreciate the people and animals God puts in our path. And to celebrate the lovely, whimsical bit of Creation we share space with every day. So sorry for your loss. We lost a 17 year old cat two years ago after a long illness. I completely understand the grief. Now cat haters — I don’t understand. Sorry for your loss! 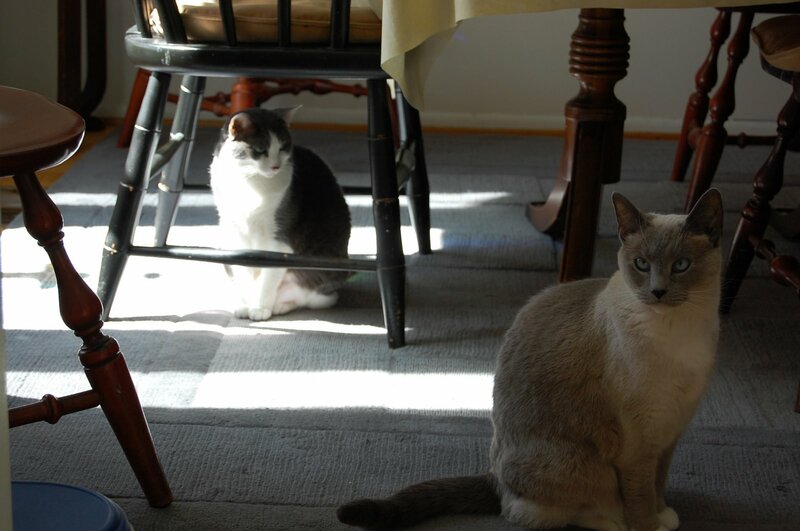 I have two cats and two dogs…just last night the cats were driving me bonkers tearing around the house. This is a good reminder that I’ll miss them when they are gone and to appreciate today.